Distinctive features Shoq has a muscular build and fleshy features. 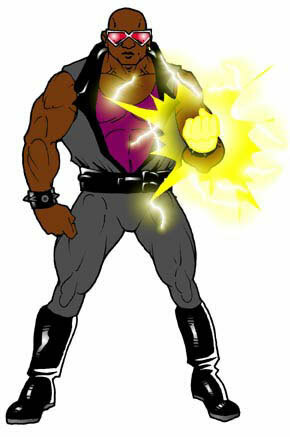 He has a pierced left ear and a tattoo of a lightning bolt on his right shoulder blade. After their father left them at a young age, Shoquil's brothers both joined a local gang, the Outlaw Gangstas. When Darnell was killed by a rival gang member and Darius was killed in a police shoot-out, Shoquil joined as their replacement. When he was 22, he attempted to mug a man on the platform of an elevated train station. The man and Shoquil struggled and fell onto the electrified third rail of the train tracks. Both men should have been killed by the tremendous surge of electricity, but instead gained megahuman powers (see Nimbus). Shoquil returned to his gang and used his newfound electrical abilities to take over as leader. Now going by the name Shoq, he renamed the gang the Outlaws and plots to take over Chicago's criminal network. Personality Shoq covets power, and will not let anything stand in his way. He leads his organization with an electrified iron fist, and will not abide treachery or deceit within his circle. He likes fast cars, fast women, and lots of money. Shoq has an electrical touch that can be fatal. He can generate an electrical shield in front of him to protect him from bullets and other projectiles. His strength has been increased to the point where he can lift several tons and punch through brick walls. He can absorb electricity to increase his strength even further. Skills He is skilled in the knowledge of firearms and narcotics, and has extensive local criminal contacts.